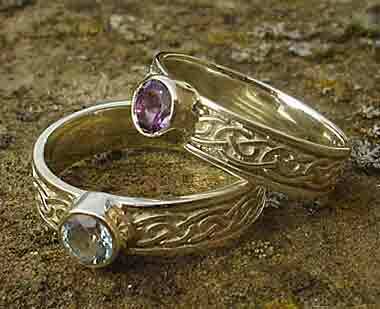 CELTIC ENGAGEMENT RINGS : SCOTTISH Made : LOVE2HAVE UK! The BEST! Quality Scottish Celtic engagement rings for women at the lowest prices. Like the Celtic wedding rings section, this section of our website is by far the most traditional jewellery we feature, but very popular still with our customers. Skilled craftsmen and women make all the Celtic engagement rings listed by hand on the Scottish islands of Shetland. We sell not only white diamond Celtic engagement rings but coloured stones also, such as amethyst and amber to name but two. Nothing on our website is imported or made abroad. All of these Celtic engagement rings are designed and made here in the UK with a passion and to the very highest of quality and craftsmanship. We offer a full guarantee and an after sales service should you require it.